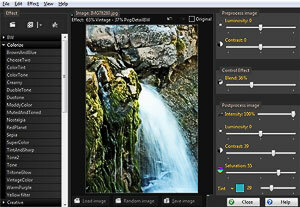 Photographic effects, affordable image enhancement software. The random image button picks at random an image from any collection, no matter how large, and applies instantly the active effect. A great way to rediscover old images and inspire new ideas! Inspiration: Find new lines of artistic interpretations of your images, click an effect and view immediately the result. Or use the Random effect generator, endless surprises and new ideas. Rediscover your old photos. With the "Load random image" button that can handle large collections of photographs spread on different folders and show them randomly with an effect. You will see photographs you maybe forgot or perhaps discarded. Build your own collection of unique effects with the random effect generator plus the controls to fine tune. Your own pictures are your gallery of effects: Each image saved with the program contains the recipe of the filter used. 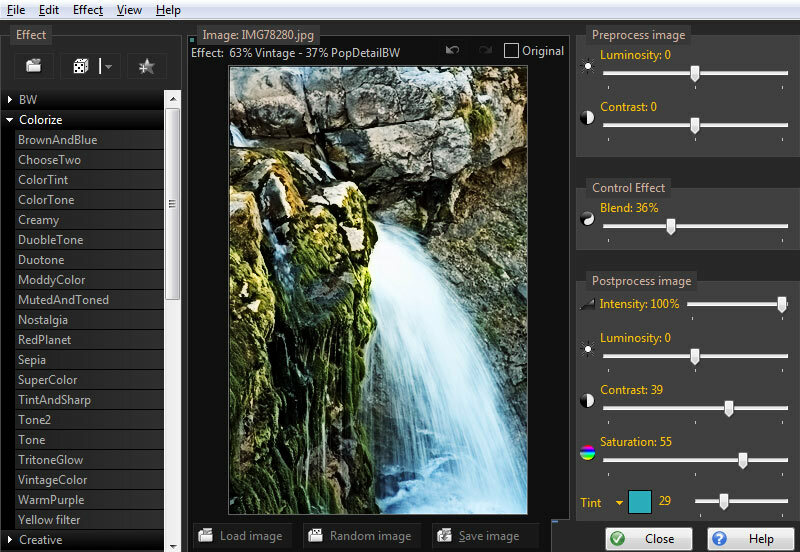 With PhotoChances-Lab you can apply that same effect to any other image as easily as dragging it to the program's icon. Uniform style: Once you have an effect you like, apply it easily in as many other images as you want with a simple operation.